United Nations Secretary General Ban Ki-moon speaks during a side event entitled: "Mayor’s Focus Session: Cities’ Response to Migration" at the the World Humanitarian Summit in Istanbul, Tuesday, May 24, 2016. U.N. Secretary-General Ban Ki-moon’s visit to his native South Korea this week has further fueled speculation that he may seek his country’s top job next year, after his United Nations tenure ends. “I’m returning back as a Korean on January 1, next year,” the U.N. chief told South Korean journalists this week on the sidelines of the Jeju Forum for Peace and Prosperity. “What I ought to do as a Korean citizen, I will think about that then, and make a decision and seek advice if necessary,” he said. The ambiguous answer amplified media speculation in South Korea that Ban could make a run for the presidency, possibly on the ruling Saenuri Party ticket. The party has been down on its luck since losing its majority in the National Assembly in April, and fielding a respected candidate like Ban could boost its political fortunes. “Most U.N. officials have long assumed that Ban is angling for the South Korean presidency,” said Richard Gowan, a U.N. expert at the European Council on Foreign Relations. Ban is very popular at home, where he does consistently well in polls of possible presidential contenders. He used to joke with U.N. reporters that he was the most famous South Korean until his compatriot, Psy, became a global YouTube sensation in 2012 with his Gangnam Style dance video. As the world’s top diplomat and with no shortage of crises on his plate, Ban’s office has repeatedly dismissed suggestions that he is looking beyond December 31st. “The secretary‑general has made it clear that his focus remains -- and will remain -- on his job as secretary‑general,” his spokesperson Stephané Dujarric told reporters this week. 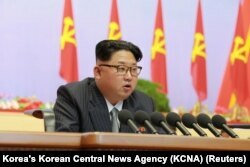 As U.N. chief, he has been very vocal on the issue of relations between the two Koreas, urging a return to dialogue. “I welcome all efforts to move forward, and I stand ready as secretary-general of the United Nations, and also personally, to contribute in any way that might be helpful,” he said Thursday in Jeju. While in South Korea this week, local media reported that Ban attended a dinner hosted by Unification Minister Hong Yong-pyo. Several senior Saenuri party lawmakers reportedly were also present at the dinner. “Some Korean analysts have argued in private that Ban might be too old and too conservative to represent their rapidly developing country, but with tensions on the peninsula high, he looks like a force for stability,” Gowan said. The U.N. chief will turn 72 next month. South Korean presidents are limited to a single five-year term. The next president will take office in February 2018. Ban could face some stiff competition if he makes a run for the Blue House, the Korean presidential residence, said Charles Armstrong, professor of Korean studies at Columbia University. "There are some strong potential candidates on the opposition side, including longtime candidate Moon Jae-in and former Seoul mayor Park Won-soon - who has not yet declared his intention to run - who might give Ban a tough fight were he to run on the conservative ticket," Armstrong said. "Third-party candidate Ahn Cheol-soo could also be a strong contender, and potentially a spoiler in the presidential race," he added. In general, it is notoriously hard to predict the outcome of Korean presidential elections, Armstrong notes. He also cites Ban's lack of political experience as a potential weakness. Before taking over at the United Nations in 2007, Ban was South Korea’s minister of foreign affairs and trade from 2004 to 2006, under President Roh Moo-hyun. As a career diplomat, he spent 37 years in the foreign ministry, with postings in New Delhi, Washington and Vienna. If Ban seeks and wins his country’s presidency, he would be the second former U.N. chief to do so. In 1986, Kurt Waldheim became president of Austria after serving as the world body’s fourth secretary-general.